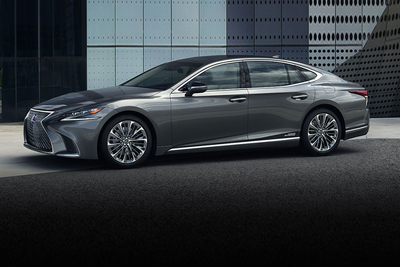 This year the Lexus brand has its 30th birthday, and its LS flagship is all dressed up and ready to celebrate. The traditional conservative design has been remade into a slinky, eye-catching and bold inside and out. Toss in a multi mode hybrid engine and add on every tech bell and whistle, and the result very impressive - to both driver, and in some cases, the people the driver is trying to impress. The engine tested for this article was a 3.5L 24-valve V^ DODC with a Lexus Multistage Hybrid system. You can dial it into 5 different driving modes - ECO, Normal, Sport S, and Sport S+. Toyota has continued to refine and enhance its hybrid tech to the point that you literally can not tell when electric and fuel transition. The Executive Package test vehicle interior felt like a limo, with prismatic swipes and wedges of Kiriko glass, quilt stitch perforated semi-aniline leather accented with brushed aluminum, wood, and soft leather. Both front and rear seats can be adjusted in two dozen, yes, two dozen ways as well as performing customized shiatsu massage for those long journeys. The infotaiment is provided by a 12.3” widescreen and is controlled with the latest version of Lexus’ touch pad-based Remote Touch Interface,as well as voice commands. The system takes a bit of time to get used to, but this is true of all tech (and a lot of people too). The driving experience puts smiles on drivers and passengers alike. The ride is silky smooth and a handling in both normal and sport modes is stable and controlled. Even on the twistiest of mountain roads, this LS has confident stability. Easier, then, it becomes to bath in the 23 speaker, 2,400 -Watt Quantum Logic sound system. (I wonder if "Quantum Logic" is like being rational in two places at the same time). The 24" Head Up Display (HUD) makes for an excellent co-pilot. It can be customized to display speed, speed limit of current road, upcoming intersections with stop signs (which are often hidden by bushes) nave turns, current gear, RPM, front crossing pedestrian and traffic, compass, lane detection and more. Rear seat riders get full back seat environmental controls, seating position controls, overhead lighting and shade adjustments, and audio control. The simple truth is that Lexus LS 500h continues to be a class leader by elevating the standards of reliability, safety and innovation. Welcome to your 30's, Lexus !